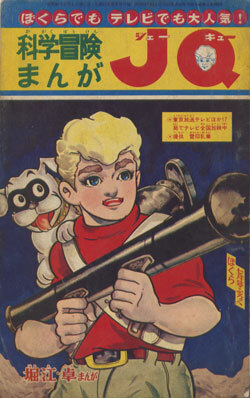 A 48-page, black-and-white Jonny Quest comicbook published in Japan: "Kagaku Bouken Manga" (Scientific Adventure Cartoon), July 1965. These Japanese "menko cards," were used as playing pieces in children's games, much like pogs. 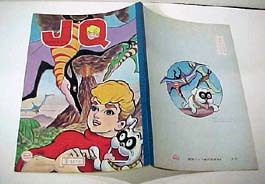 Jonny Quest "sonosheet": "Mystery of the Lizard Men"
Here are images and information regarding a third Midori publication from Japan, this one focusing on the "Mystery of the Lizard Men" story. This book came with a red vinyl 33-1/3 rpm record. 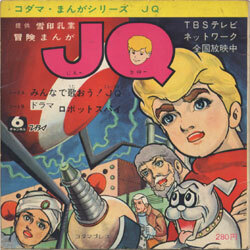 Jonny Quest "sonosheet": "The Robot Spy"
"J.Q. / Song 'Let's sing all together! 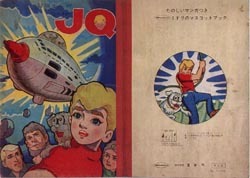 J.Q.' / Drama 'Robot Spy' / Being nationally televised on TBS Network / Kodama Manga Series." More information and scans of the pages. Jonny Quest Sketchbook: "Pirates from Below"
1966 Jonny Quest Sketchbook: "Arctic Splashdown"
Craig's copy of this has 12 sheets of blank sketch paper. There don't appear to be any missing pages, so this may have been just a sketchbook with no comic inside. Here are the front and back covers. The inside front cover is an outline/line drawing of the cover. The inside back cover is an outline/line drawing of the Turu cover. 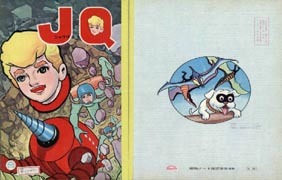 Jonny Quest book: "Turu the Terrible"
Does anyone have any definitive info? This Columbia Video Disk (laser disk) was distributed in Japan, exact year unknown but most likely in the 1990s. 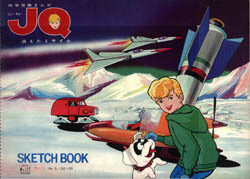 The episodes, "Turu the Terrible" and "The 'Q' Missile Mystery," were dubbed in Japanese. 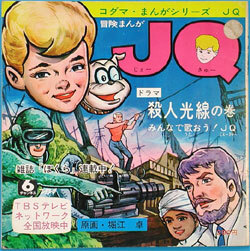 Sadly, Craig's copy of the laser disc was cracked by the seller and cannot be played, so we may never know whether the "Jonny Questo" theme song from the Robot Spy sonosheet book was used somewhere on the disk.